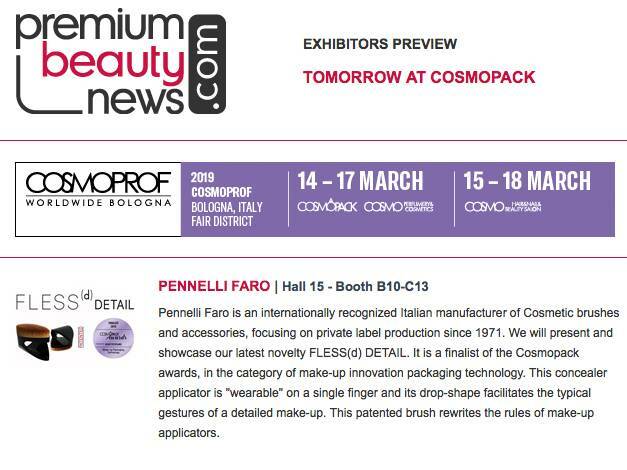 Pennelli Faro is an internationally recognized Italian manufacturer of Cosmetic brushes and accessories, focusing on private label production since 1971. We will present and showcase our latest novelty FLESS®(d) DETAIL. It is a finalist of the Cosmopack awards, in the category of make-up innovation packaging technology. This concealer applicator is "wearable" on a single finger and its drop-shape facilitates the typical gestures of a detailed make-up. This patented brush rewrites the rules of make-up applicators.